Whew! It's funny when a little sunshine comes out how difficult it is to fit Project Life in to the schedule. I'm trying to sneak in this week's post during Tilly's (45 minute short!) ballet class. So... here we go! 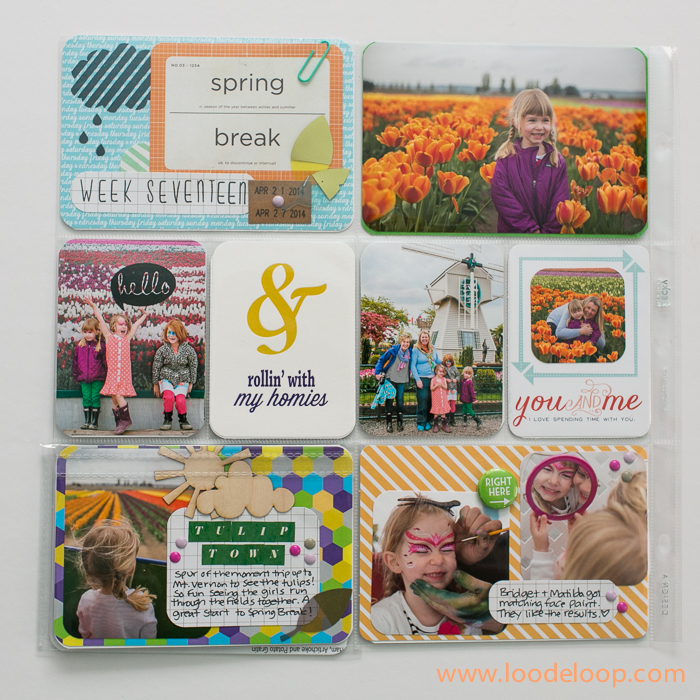 I got the chance to work with Colie's awesome May Take Ten Kit this week. It coordinated beautifully with our rainy/sunny/rainy/sunny week. This kit is chock full of goodies. I was also a very lucky recipient of the add-on stamp set designed by Stephanie Adams. I love it when my favorite scrappy people collaborate together. So cute!! Week 17 was Spring Break for us. I mean... ? Spring Break? For preschool? Fine.. At least we got to sleep in a bit in the mornings. (Ha!) We had a great time this week. Tulips, Zoo trip, and running a 5K were the big highlights. So, the main components used this week were from the Take Ten Kit. I pretty much KNEW I needed to use that "Rollin' with my homies" card as soon as I saw it. The green alphas were from the kit as well and sweet little wood veneer sunshine and clouds. Right side was made using Becky Higgins HSN exclusive "Just Add Color" page protector HSN 2. 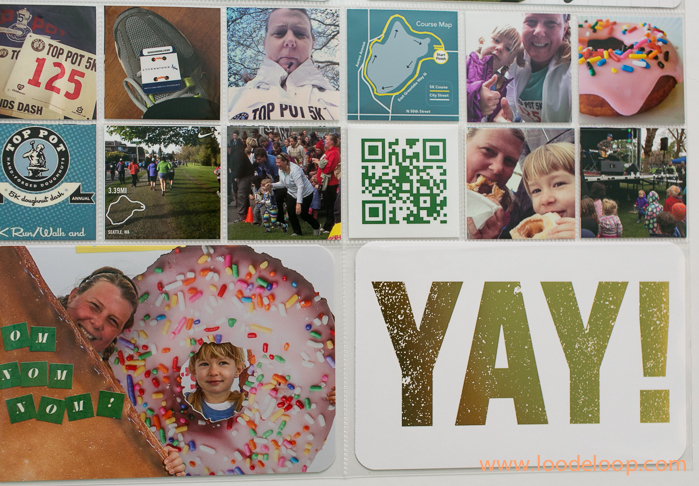 I thought all the little 2x2 slots would work well for lots of little photos from the 5K I ran. Tilly also participated in the Kids Dash (200m! Woo hoo!!). That gold "YAY!" card? Obsessed. 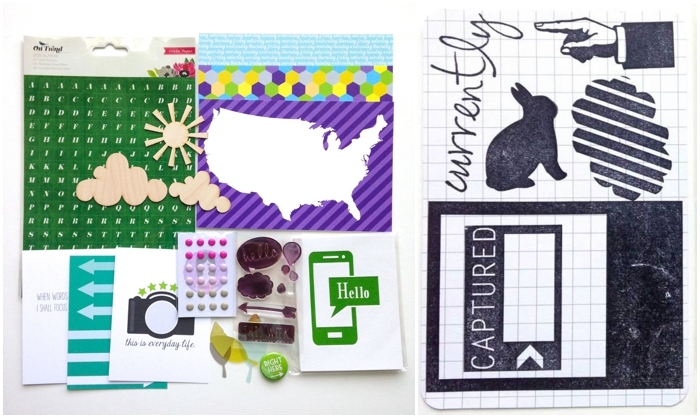 This is from Studio Calico's "Pretty Little Paper Pad" that was made available to subscribers on Sneak Night. Wish I had bought two of these sets. So beautiful! Another QR code this week. This is of Matilda's race. All 20 seconds of it. ;) Did I mention that this was a 5K put on by Top Pot Doughtnuts?! Pretty much the whole reason why I signed up was the promise of a hot doughnut waiting for me at the finish line. Mmmm. 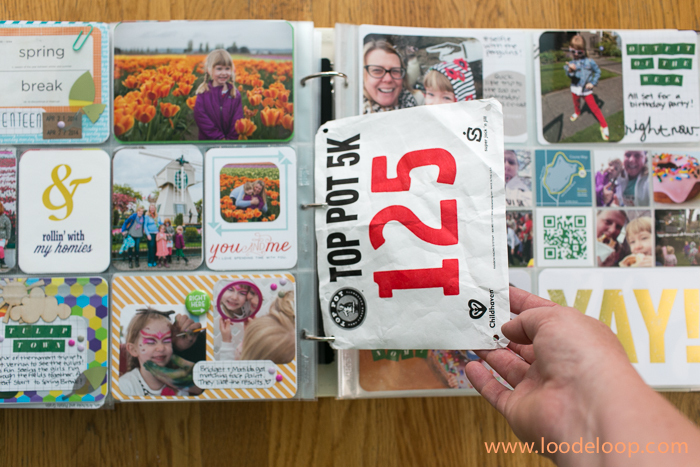 And of course, the obligatory race bib goes in the album, too. Because... well. I finished!! Woo hoo! I love how you used the kit Melissa! Great Job! 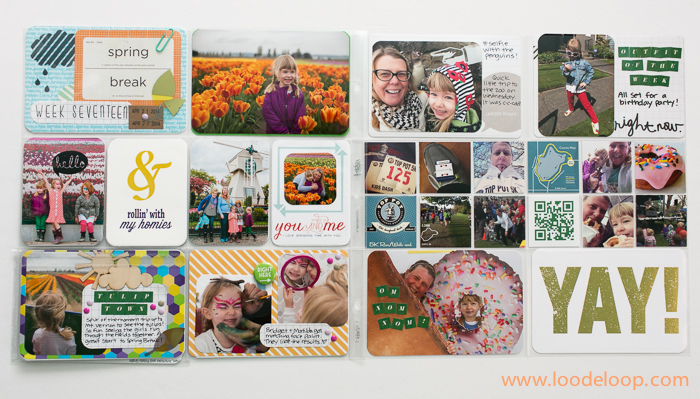 I just went and signed up for that kit after seeing how you used it - such a gorgeous layout!